These pictures show how the centre will look after the old library and health centre have been demolished. Landscaping, new additional car parking and there will also be a great new children's play park. All this is part of Conservative run Rushcliffe Borough Council's Cotgrave regeneration work. The new Cotgrave Hub is open! We have been telling you about the ambitious and exciting plans for Cotgrave that have been in progress for a few years now - these things do take some time. And here we are now with the brand new multi-use building now open. Brand new library (how often do you read that nowadays?) Brand new health centre, Brand new Police station... All in a wonderful modern efficient new building. Then there is the smart refurbishment of the shops (which actually look brand new too) ALL HERE IN COTGRAVE! There is more to come of course... The old library, health centre and police station will be demolished early in 2019 and that area will be landscaped along with new extra parking spaces and a brand new children's play park. And there's more! The other row of shops will also be demolished later in 2019 and four brand new retail/service units will be built in their place. All this is part of the £10 million pound investment in Cotgrave which has been led by Conservative - led Rushcliffe Borough Council who worked with Nottinghamshire County Council (Conservative led now, thank goodness) , the Health Service/local clinical commissioners, and the Police to bring all this to us. And we mustn't forget the 15 brand new commercial buildings that are at Hollygate Park - all let and all providing jobs and investment. So, the next time someone from another political party starts going on about "council not doing anything for Cotgrave", then perhaps you might wonder what time zone they are in!! When this new building is finished and open, the old health centre and library and police station will be demolished, and that area will be re-landscaped, new/extra car parking spaces will be created, along with a brand new play area and equipment. Some people are interested in what the layout of the site will be like when the old library and health centre and police buildings are demolished. Here is a layout plan (pdf document) showing the extra car parking spaces and open area. Amazing timelapse film that shows the conversion and transformation taking place of the main row of shops in Cotgrave centre, along with the creation of the business/office units upstairs. Well worth a view! It is not an artist impression - it is real, in place now. Interesting article in today's Nottingham Post, about the fantastic new office/business units that are now available to local businesses above the refurbished shops. Work on the new multi service building next door (new health centre, library, police station and Rushcliffe Borough Council drop-in centre) is progressing very well indeed. As well as all this in Cotgrave centre, we also have the 15 brand new commercial business units on Colliers Way, which have all been let already! 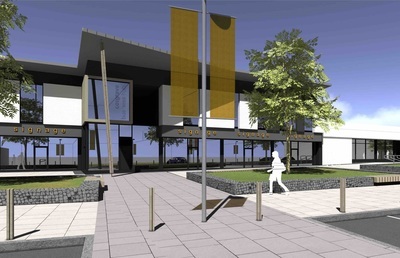 Here are some details about timing and plans for Cotgrave centre regeneration work. Note that Scotland Bank is due to be demolished from later this month. As with any big project like this, there is bound to be some mess and inconvenience as the work is carried out. Please do try to support the local shops and businesses there whilst this all takes place. September 2017 – May 2018: Current proposed date for improvements to shop units and the area to the rear of the shops. Flats above the shop units will be converted in to a new business centre. Rushcliffe Borough Council and Cotgrave Town Council encourage residents to support their local shops during the improvements and will be working with local businesses during this time. Please shop locally and support your local businesses. Planning permission has now been granted for the precinct regeneration. This is a major milestone and is good news for Cotgrave. This is for the improvement and regeneration of shops, a brand new building which will house the brand new health centre, library, police and council offices. Construction work is due to start early in 2017. 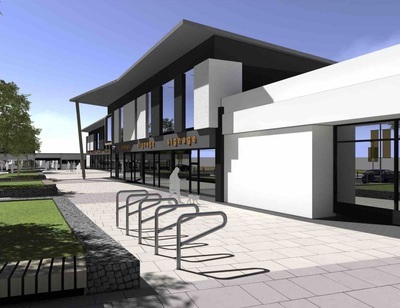 Detailed planning documents and reports for the actual now-live planning application for the precinct refurbishment, can now be viewed at Rushcliffe Borough Council's ﻿website﻿. Hopefully you will find this interesting and also see just how much work is going in to this project and investment in Cotgrave. You can also see the plans and paperwork for the new multi-service-centre building, which will be the new health centre, library, police station and council contact points. And here is an interesting factual article that has appeared in a business/trade publication. You can also view them on this website. These are the designs and plans that are about to be submitted for planning permission later this month. As well as these retail and office units, plans are also going through now for 15 brand new business/commercial units at Hollygate Park, all as part of the Cotgrave regeneration project. Below are extracts from a speech and report that Richard completed in connection with last night's Rushcliffe Cabinet decision. I hope it makes things a little clearer and factual. And we must not lose sight that it is not just the precinct that we are talking about, but it is the other employment creation opportunities that are part of the whole package at the proposed new business units on the colliery site. There have been some unhelpful messages appearing on other websites regarding a change of policy/plan by a potential supermarket which was considering being part of the regenerated precinct. 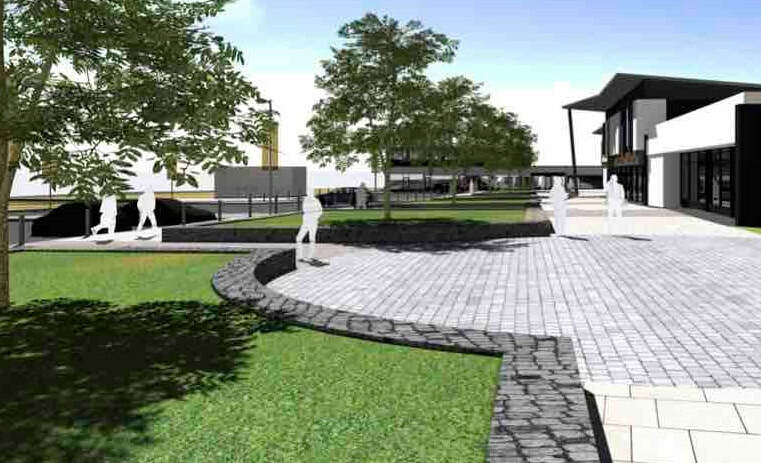 It is true that there has been a bit of a set-back, but Rushcliffe Borough Council along with the other bodies and agencies, are still committed to the regeneration project. These things are always rather complex and there will always be "ups and downs" along the way, but when you have such a moment, instead of running off to the media hoping to score some points, it is actually far better to meet up calmly with others involved, sit around the table and work together to find a way forward. April 2015 update Just to clear up any confusion and misunderstandings that you may have heard. 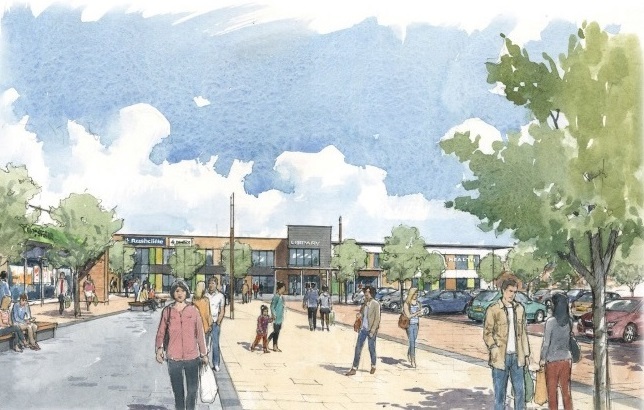 Very simply, the precinct will be improved and regenerated - it is part of the planning permission requirements of the Hollygate Park housing development. The plans and work are being led by Rushcliffe Borough Council who are working with Nottinghamshire County Council and other relevent organisations. A huge amount of time and investment has been, and continues to take place in preparatory meetings and discussions at top levels across the board. These include key partners and players from the local authorities, NHS/Health sector, the Police and commercial companies, who will all be part of the exciting and even more positive future for Cotgrave. The nature of these discussions require considerable amounts of professionalism and confidentiality - the positive prospects for Cotgrave cannot be underestimated. It is hoped that there will be a public announcement/displays etc over the summer when matters and plans are further confirmed, which build on the previous public exhibitions and consultations held over the last few months. There is lot of interest and discussion about the Cotgrave Masterplan and we thought it might be helpful to give a bit of background. It is quite a long story going back over 20 years. Ever since the colliery closed in 1993, there has been talk about the future development of the site. Over the years consideration had been given to housing, industrial, commercial, business use or a combination of all. At one stage there was talk of many more hundreds of homes than are now planned there. But now the plan is for up to 470 of all types along with commercial and business units. There will also be new playing fields, allotments and open green areas, orchards and ponds. But we also felt that the new development should not be separate of or stand alone from existing Cotgrave, and nor should Cotgrave be "forgotten". So as part of the planning for the colliery site, requirements were put in place that the centre precinct area of Cotgrave should be improved - it is an unfortunate example of 1960s architecture that has not aged well. Plans include a new public services building provision and new health centre. Of course this won't all happen "overnight", but the commitment is truly there, along with the Government's Growth Point funding recently announced. 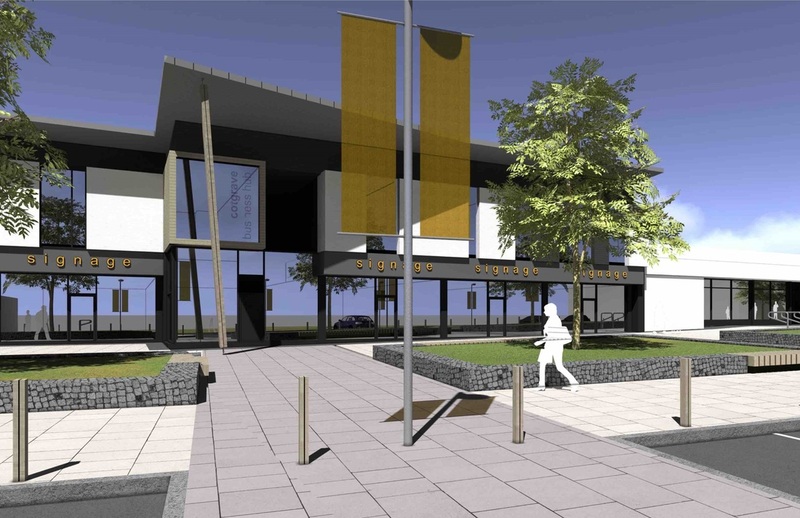 Information and updates about the Cotgrave Masterplan - the redevelopment and improvements to the precinct and centre of Cotgrave. Work is progressing swiftly and well at the site. There was a developer's launch event recently where details of the houses and development were announced. This was very well attended by members of the public, many of whom, including families already in Cotgrave, expressed serious wish and interest in moving there. 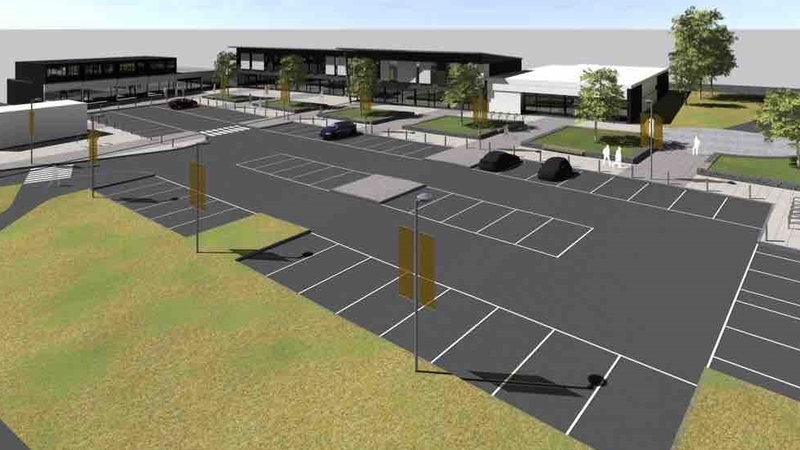 Separately, things are still going on in the background regarding the Cotgrave Precinct redevelopment. It will happen but these discussions are quite long and complex, mainly because of the number of different land owners and other interested and relevant parties involved. This is all being led and taken seriously by the right people who have Cotgrave's interest at heart. The phase one housing layout has now been agreed, which will be a development of 116 homes. Consisting of 75 x two, three, four and five bedroom homes and 41 X one, two and three bedroom affordable homes. The total housing numbers for the site are 457, which will include 137 affordable homes. Completion of the first show homes is scheduled for April/May 2015, with the first completed house sales scheduled for summer 2015. And you can see homes now being built. A "stakeholders briefing session" was held today at Rushcliffe Borough Council's offices to catch up and find out more about the hopes and ambitions for the Cotgrave Masterplan. In particular the recent news about the Government's Growth Deal award generated much genuine ambition and discussion. Cotgrave's borough councillors were invited to attend and given an opportunity to explain their views and experience. Cllr Bryan Tansley and Cllr Richard Butler took this opportunity and attended, along with the current chairman of Cotgrave Town Council, Vance Wood, who also gave a presentation on behalf of the town council.